With a crowded social media space, it is hard to stand out amongst the competition online, but it's essential to try your best. 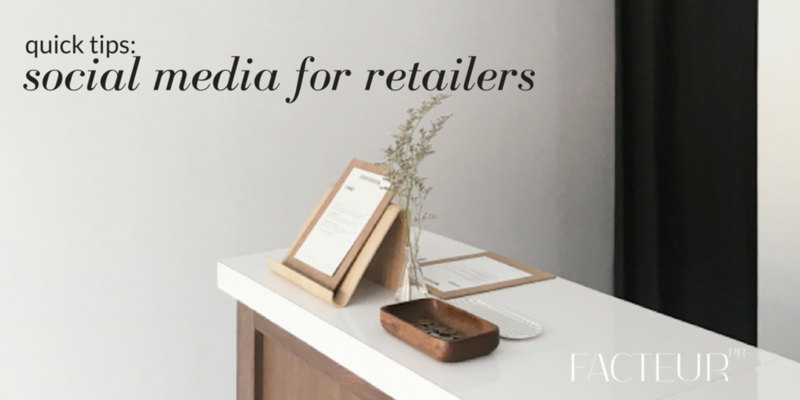 Posting content that is relatable, eye catching and relevant to your audience are just a few of the tips to practice when using social media for retail. Let's dive deeper. 1. Be relevant. Be sure to stay true to your brand and your audience. If you're a fashion retailer, stick to content that will appeal to your customer who is looking for trends and stylish clothing rather than posting images of your lunch (a little off-topic content is OK, just make sure it fits into your overall strategy). Use the right hashtags, too. 2. Show! Don’t just tell. Social media is all about the visuals, so have high quality photos and videos. While not all of your followers will see your content due to algorithms, those that do will see your images first, and then perhaps will read your caption. Always keep in mind the image you use in your post is catching the interest of your viewer first thing. 3. Consistency is key. Readers will respond better when they are seeing quality posts from your business on a regular basis. If readers see your business posting every day, that consistency will help to build more of a personal relationship with them. That relationship builds trust, and trust builds sales. 4. Pay attention to detail. Every post should be well thought out and intentional. Most of the time your followers will only spend a few seconds on your post, so make it count! 5. Make it personal. Whether it's on your website or in your store(s). you are selling to people, and on social media, you are selling to people as well, though not always through a direct transaction. Make sure your communications are personal and thoughtful, creating a two-way engagement, not just using your posts to sell. 6. Change up content. The great thing about social media is you can always experiment with your strategy. One way to do that is to switch up your content types. Try posting beautiful photos, but also videos, Boomerangs, Stories, coupons, contests, behind-the-scenes posts and more. This will keep readers engaged and interested. Just about ever retailer is on social these days. So change up your content to keep those customers coming back for more! 6. Have fun. Remember, people don't just buy products, they buy the lifestyle that comes with it. Show how much fun they will have with your products - inspire them and have fun! Anna is FACTEUR PR's Digital PR intern for Fall 2017. Instagram has always been a mobile-only social media platform, and certainly still is. And while many social media management programs such as Hootsuite have boasted the ability to post on Instagram through your desktop, it still has never been fully possible. However, just recently, a workaround on the Chrome browser has come to light. We just tested these five steps to posting photos from your desktop computer directly to Instagram, and it totally worked. Give it a try! 1. 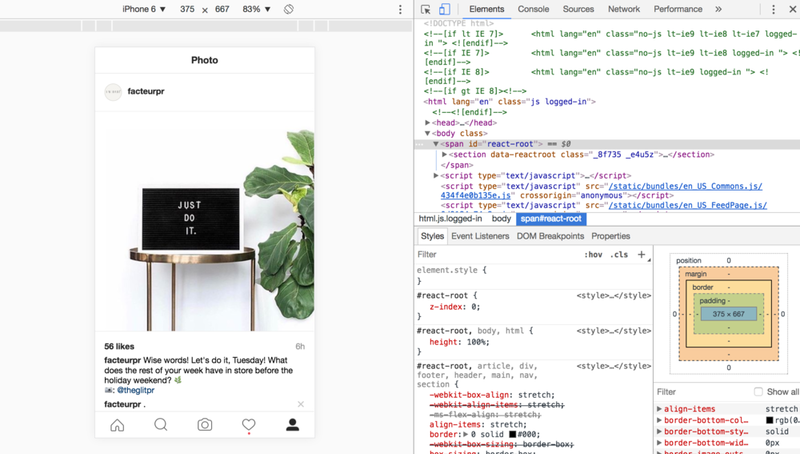 Open the Google Chrome browser on your desktop, and head to Instagram.com. 2. Right-click anywhere on the webpage. 3. From the drop-down menu, select "Inspect." 4. You will see a window like the one pictured below. Above the Instagram feed on the lefthand side, select the size of the mobile device you would like to preview. 5. To upload a photo, click the camera icon on the preview window as you would on Instagram through your mobile device. You'll be able to add a caption and hashtags as normal, too! There you have it! A quick and easy way to upload photos directly to Instagram from your desktop! Did you try it? What do you think? Sign up with your email address to receive the FACTEUR PR monthly newsletter! We respect your privacy and promise to never sell or spam your information. What is PR, and how can it help your brand or business? A friend-turned-client recently said to me, "I know I need 'PR,' but what exactly does that mean and what does it entail?" PR is a phrase that becomes synonymous with publicity, or the act of publicizing. While that is certainly part of what a PR professional does, it's not the entire story. As the name does suggest, public relations is all about relationships: building them with audiences, influencers, reporters, investors, community leaders, and more. This can be executed in a number of ways, from media outreach to blogging, and Instagramming to event planning. Its inclusivity is why FACTEUR PR has the name it does. Our four main services – public relations, social media, content marketing, and digital creative – are all tied together with one string: people. And authentically connecting with those people (your target audiences) through those defined channels is the core of our mission, no matter the avenue. That authenticity piece is very important, arguably more now than ever. (Have you watched the news lately?) While coverage isn't always a guarantee with PR, especially immediately, the slow build of awareness grows in tandem with your audience's trust – something that cannot be bought with an advertisement. According to a study conducted by Nielsen, "Ninety-two percent of consumers around the world say they trust earned media, such as word-of-mouth and recommendations from friends and family, above all other forms of advertising." This is not to discredit advertising, and yes, particularly when it comes to social story telling, buying impressions can help get your story to your target audience. But in the case of a lot of small or emerging businesses – and even well established ones! – advertising dollars are limited and arguably better spent building trust through developing and distributing your brand story through owned, shared, and earned media. By seeing me, the founder of FACTEUR PR, as someone with valuable insight into the world of marketing and public relations, you may decide to continue learning and engaging with me on Instagram, Twitter, Facebook, Pinterest, or perhaps even want to work with me directly. (I hope you do!) This content marketing effort cost me nothing but my time. OK, and the price to host my website and blog on the internet. But ultimately it has allowed me to show instead of tell my story a lot more affordably than only through an advertisement. That story sharing doesn't begin and end with your Instagram following. Media outlets often solicit story ideas via social media, and valuable content created for your owned channels can be pitched to media outlets, often garnering even more exposure for your business. Third-party coverage (provided it's positive!) also builds an important kind of credibility and extends beyond your current audience, customers, and clients, which in turn can boost yours. Now, while creating and sharing content is usually more affordable than advertising, it doesn't always come for free. But oftentimes we have to spend a little money to make a little money, just as you need to spend time creating content and sharing content. As your business begins growing, you may very well find yourself lacking the time to do it all as you may have when first launching. More resources are dedicated to operations, providing services, creating products, and client relations. The idea of pausing to share all of these amazing developments may seem out of the question. But it's sharing those exciting developments with your audiences, media, and potential audiences that can also feed back into your business and grow it even more. So while dedicated public relations services are often an expense, it must be noted that it's certainly an investment – that returns. As shared in Entrepreneur, "The ROI on PR is off the charts. When you think about all the places your story goes and the impact it has, you simply can’t afford to not invest in the discipline. Because it’s not something that can be hacked and requires tremendous patience to see the payoff, some companies tend to look at PR as an overhead expense. In reality PR should be seen as a profit center. From recruitment to SEO growth and business development, PR can serve as a catalyst that gets your brand in front of the right people as you scale your business." In summary, paid media is still important (especially when it comes to amplifying your efforts via digital), but promoting your business through owned, shared, and earned media is going to offer you the opportunity to 1.) show, not just tell, your story, 2.) authentically connect with, engage, and grow your audiences (and ultimately your customer base), and 3.) be more affordable, getting more bang for your buck. However, it can take some patience to see the return on your investment, but that can be said about building a brand or business, as well. The journey and the destination are all a part of your story! We hope this information is helpful! Sign up for our monthly email below to get more tips and ideas delivered straight to your inbox. And as always, please feel free to get in touch if you'd like to discuss how FACTEUR can help you and your business with public relations. Sign up with your email address to receive news and updates from FACTEUR PR once a month. Welcome to the fourth edition of Three on Thursdays, our new weekly blog series where you'll find a few of latest marketing and PR insights and tips to help grow your brand and business. Every week, we'll handpick three good-to-know tips or resources that can help educate and inspire your own efforts. Be sure to sign up for our weekly newsletter below to get these and other tips delivered to your inbox every month! With better access and understanding of digital marketing and social media analytics, we hear a lot about using data to drive our communications efforts. While the numbers are telling and important, you can't lose sight of the real drivers: people. Molly Reynolds makes the case here in this story from the Huffington Post. Consistency, clarity, and continuity are just a few of the qualities Anna Jasinski suggests you conquer when strengthening your personal brand online. "Branding is not something we should approach with skepticism. If you don't take control, people will [make their own decisions,"] says Ren LaForme of Poyter in Jasinski's story. Sounds like good old fashioned PR, right? Own it! I've written about the importance of content marketing, and believe in it so much we offer curated content marketing workbooks here on the FACTEUR website. Having a content marketing strategy not just fuels your blog, but also your PR plan, media relations plan, and social media plan. In this PR News story by Erika Taylor Montgomery, she leads with an astonishing stat -- "82% of consumers feel more positive about a company after reading their custom content. By creating effective content regularly, you're leaving the public with a positive impression of the brand" -- before launching into ways to incorporate that content into a PR strategy. > Looking for instant to committed marketing and PR support? FACTEUR PR can help. Sign up with your email address to receive news and marketing tips from FACTEUR PR. We respect your privacy and promise to never spam or sell your email. Welcome to the second edition of Three on Thursdays, our new weekly blog series where you'll find a few of latest marketing and PR insights and tips to help grow your brand and business. Every week, we'll handpick three good-to-know tips or resources that can help educate and inspire your own efforts. Be sure to sign up for our weekly newsletter below to get these and other tips delivered to your inbox every month! 1.) Pinterest wants you to know your business matters. The social media channel has been releasing a series of educational videos targeted towards business owners to help you make the most out of your Pinterest account. This week, we're watching "Why businesses matters on Pinterest." You should, too! The video covers how great ideas in a space meant for ideas leads to interest, re-pins, and ultimately: sales. You may start to notice that your Facebook messenger is looking a little different these days. In an effort to spark more conversations with the app, Facebook has started including conversation topics into your messenger feed. What this could mean for your business? If you're hosting an event, and a person RSVPs, it's very possible that his or her friend on Messenger will see they are attending, as well. Read the full story from TechCrunch here. 3.) How to delete your MySpace account if you don't have access to the e-mail you used to log in. Tried and tested: if you want to delete your MySpace account but can't login, because you no longer have access to your email address you used to log in and/or have forgotten that password, complete and submit this form. We did, and it worked! Sign up with your email address to receive these updates and more, straight to your inbox every month! Ahh, Monday! It's hard to think about making time to curate content for your social media channels Monday through Friday when an early week to-do list seems almost a mile long. Here are just a few opportunities this week to align your brand or business with some already note-worthy happenings online. Want more content ideas? We spent some time this spring developing four editorial content calendars specifically for the food & drink, arts & stage, health & wellness, and lifestyle industries. You can find them under the Instas tab here on the FACTEUR website (and showcased below). We've pulled together social media, blogging, and PR opportunities based on monthly and daily holidays, hashtags, and high profile events that are related to each of those industries. Also included is a list of story ideas to get you started with developing your editorial plan, as well as space to brainstorm your own ideas. Right now, we're offering each calendar for $10, and if you buy all four with our Blogger Bundle, you basically get one free! Plus, every time we update the calendars, we'll make sure you'll get the newest iteration (at no extra charge, of course). You know the saying: if you fail to plan, you plan to fail. Put your marketing and communications plan on paper with our guided template. In this 33-page file, you'll receive an organized, presentation-ready template for you to document your plan strategically and chronologically through the year. In addition to analysis exercises to nail down your goals and objectives – and what you need to do to achieve them – this template also includes space for a yearlong strategies summary and month-to-month plan. Specific sections of this template are customizable and include a summary, situation analysis, target audiences, goals & objectives, strategies, accompanying tactics, measurement milestones, and budget considerations. Please note: This document does not include specific marketing and communications ideas. Need a place to start? Check out our Content Calendar Workbooks! *A .zip file with a Microsoft Powerpoint file and editable Adobe PDF files will be automatically delivered via email immediately after purchase. Save 15%: With this bundle, you get it all: the Health & Wellness, Arts & Hobbies, Food & Drink, and Lifestyle content calendars. 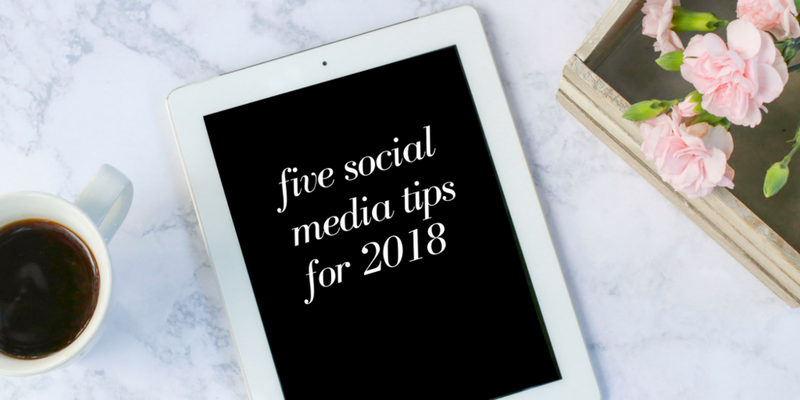 In this instant downloadable PDF, we'll share a year's worth of happenings related to these industries to help align your brand with media and social media opportunities, as well as blogging ideas. Perfect for: Lifestyle bloggers, hospitality industry, health and wellness coaches, restaurants, or brands that want to get more creative with their digital storytelling. In this instant downloadable PDF, we'll share a year's worth of happenings related to the health & wellness industries to help align your brand with media and social media opportunities, as well as blogging ideas. In this instant downloadable PDF, we'll share a year's worth of happenings related to the the food & drink industries to help align your brand with media and social media opportunities, as well as blogging ideas. In this instant downloadable PDF, we'll share lifestyle story ideas - like wellness, DIY, relationships, beauty, recipes, and more - to help align your brand with media and social media opportunities, as well as blogging ideas. Ask us anything! Consulting hours give you and your team one-on-one access to FACTEUR founder + director, Reena Goodwin, for 60 minutes via phone, Skype, Zoom, or in-person. Conversations may be broken up hour-by-hour if purchasing two hours+. Curious to know if we can cover your topic? Send us an email at hello@facteurpr.com! After you've purchased your hours, you will be contacted immediately to set-up your consultations at (a) time(s) that work best for you. Looking for more guided coaching? Check out our Apprised package!